Oldtin stands in the dooorway and keeps an eye on the hall. Het spends a good couple of minutes, using his keen senses to search the floor. Satisfied that all is safe, he enters the room and approaches one of the tapestries. Each is about 10 feet wide, and stretch all the way up to the 10'high ceiling. They are spaced such that there are two on the south wall, and two on the north, separated by a 10' section of plain wall. The SE tapestry is badly faded and rotting. You think it maybe depicts the picture of a devil, but you are not sure. He swiftly tears it down, revealing more blank wall behind it. Continue with the other three in the same manner? Het will peek behind each tapestry first, to make sure there are no unseen dangers. If he sees nothing, he'll tear them all down. 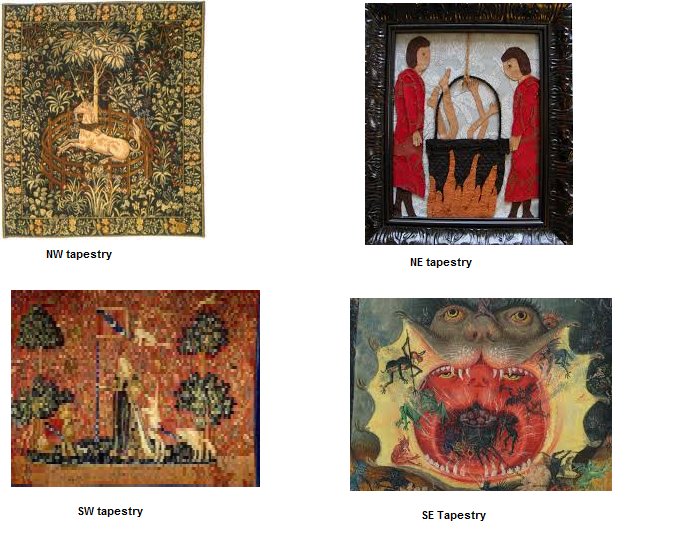 Serech will look at each tapestry and try to decipher their story. They are there for a reason, I would suppose. He will stand away whilst they are torn down. Het says, Well, as best I can tell, this room is indeed empty. Shall we get back to planning our ogre ambush? "Yes, please!" Rhod says. "It was my first plan, and I want to see how it works out." "Bah, just some moldy tapestries. Me spear and handaxes are at yer service, let's go hunting for ogre!" Oldtin says.